If you suffer from anemia, are pregnant or are planning a pregnancy, the dietary nutrient folic acid is especially important to your health. Folic acid, also called folate and vitamin B-9, is essential to red blood cell and normal fetal growth. Your body needs folic acid every day to replenish body stores. If your levels are low, you may need to improve your diet with nutritious foods or vitamin supplements. Follow safety guidelines for increasing dietary B-9 intake without affecting your other vitamin levels. Dietary folic acid is necessary to prevent or treat anemia and prevent birth defects, which develop in the first weeks of pregnancy. A doctor's diagnosis will confirm a potential folic acid deficiency or reinforce your need for daily vitamin B-9 intake if you are a woman of child-bearing age. According to the Centers for Disease Control and Prevention, one month of 400 mcg of folic acid per day is a safe rate to overcome a vitamin deficiency. You might not be able to get that much vitamin content from the foods that you eat. Your health-care provider may order a different daily dose and should supervise any supplements that you take. Every food group offers items with moderate to high amounts of natural folate or its equivalent, synthetic folic acid. Compare the contents listed on package labels. Eating cereal every day may be the quickest way to increase your vitamin levels from foods. Enriched grain products such as cereal and pasta with 100 percent daily values of folic acid per suggested serving, or 400 mcg, have the most of all food sources. 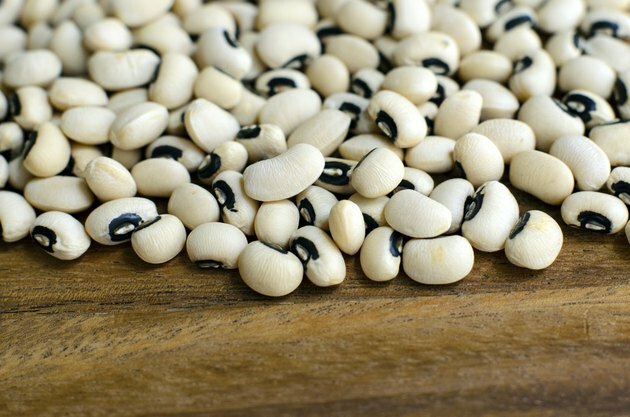 Lentils, black-eyed peas and pinto beans have naturally high folic acid values as great as 90 percent per 1 cup. Beef liver, cooked spinach and orange juice all contribute more than 20 percent daily value of folic acid per serving, and romaine lettuce, raspberries, yogurt and eggs offer moderate content below that. Let your doctor recommend folic acid vitamin supplements in the correct dosage, if necessary. You may be encouraged to take vitamin B-9 as stand-alone pill or part of a multivitamin or prenatal vitamin complex. The National Institutes of Health Office of Dietary Supplements considers a supplement safe to take in addition to food but warns consumers not to take more than 1,000 mcg of supplemental folic acid per day, to preserve healthy vitamin B-12 levels. Besides affecting physicians' diagnosis of potential vitamin B-12 deficiencies, large intakes of folic acid have been associated with cardiovascular risk in heart patients and certain cancer risks in the general population. Folic acid supplements can also interact with certain medications for seizures.